Escorsen's hermitage is deep in the Leonese Marshes on the eastern side of the Island of Melderyn. The setting is simple and isolated, typical of the dwelling of a hermit. People who have encountered Escorsen have described him as a slightly eccentric Ilviran priest. But Escorsen is not all that he seems; those few who suspected he was other than he let on are no longer among the living. 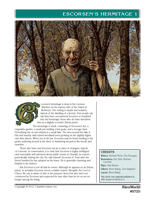 The Escorsen's Hermitage article describes Escorsen of Tenir (including HârnMaster stats), his hermitage, and the barrow graves in the surrounding marshes. It includes full-color GM and player maps as well as floor plans for the hermitage buildings and a barrow grave. This is a Hârn Classic article and was originally published in 1987 as part of Hârnlore 2.